Goodreads Summary: Aria is a teenager in the enclosed city of Reverie. Like all Dwellers, she spends her time with friends in virtual environments, called Realms, accessed through an eyepiece called a Smarteye. Aria enjoys the Realms and the easy life in Reverie. When she is forced out of the pod for a crime she did not commit, she believes her death is imminent. The outside world is known as The Death Shop, with danger in every direction. 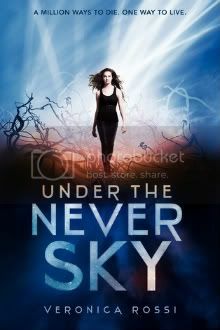 Combining science fiction with hints of dystopian ideas, Under the Never Sky is a fresh story that, after my recent luck with sci-fi titles, I was looking forward to reading. For me, however, this book did not live up to its hype. Aria has spent her life in the Reverie Pod, hanging out with her friends in virtual Realms through her Smarteye. But after an adventure gone wrong in a rundown part of the Pod, Aria is cast out into the Death Shop and left there on her own, without a Smarteye. Fortunately, she runs into Perry, an Outsider who is facing his own struggles. Despite the fact that Aria is a Dweller and Perry is an Outsider, it turns out that they have much in common. Both were blamed for something that wasn't their fault, and both have to embark on a journey to try and make everything right again. Together they travel across the Death Shop and make some surprising discoveries about each other and themselves along the way. It took me a while to get into this book and even longer to care about the main characters. I felt as though Aria's home world, the pod of Reverie, was not well established before Aria was forced to leave it. Similarly, though Perry's world is easier to grasp, I wanted more detail here as well. However, I could have overlooked this, because over the course of the book more is eventually revealed. What bothered me the most throughout this story was the lack of connection with the characters - both my connection as a reader and also Aria and Perry's connection with each other. For a time there was so little dialogue between them that it was very hard for me to appreciate where these two characters ended up. With that, although both Aria and Perry are (or try to be) genuinely good people, for some reason they just didn't seem quite real to me. All of that being said, there were things about this book that I did like. The story was very inventive and it was very interesting to see such different worlds coexisting and colliding. Also, I enjoyed the alternating points of view between Aria and Perry. There were moments of beautiful writing and some issues that were raised in the book that made me think. Despite my issues with this book, I do plan to read the next installment in the trilogy; I think it will be easier to connect to the second book now that I have more background, and I want to see where Rossi takes this story. I know that other bloggers have absolutely loved this book, and so I will leave you with their reviews to give you different opinions: See these reviews from Parajunkee and Mundie Moms. The idea of pods/domes seems to be increasingly popular in YA dystopia. I've read several positive reviews of this book, so it's nice to hear what didn't work for you.